Sure, hummus is traditionally made from chickpeas. But versions using beans are just as sure to please! 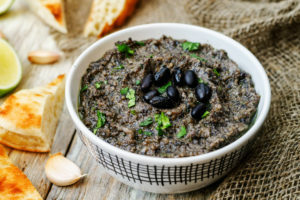 Try our dietitians’ Black Bean Hummus, which is bursting with Mexican flavors thanks to cilantro and cumin. Out of chickpeas? You don’t have to be out of hummus! This variation on the favorite spread has a Mexican-style flavor, with cumin and cilantro. Use it as a dip or as an accompaniment to Mexican meals. Place 2 tablespoons of water, ¼ cup of the cilantro, and the tahini, lemon juice, olive oil, cumin, salt, black beans, and garlic in a food processor and process until smooth. Spoon the hummus into a bowl and sprinkle with the remaining ¼ cup of cilantro. Top with the smoked paprika.